How important is your personal data to you? I don’t know about you but my mobile phone is a very important gadget in my life. I feel lost and incomplete without my cell phone. I have important data, photos, contact information, and even links with saved passwords on my cell phone. I have tons of applications and notes saved on my cell phone. My cell phone sleeps in the bed with me and it is the first thing I check in the morning and the last thing I check at night. How important is your cell phone to you? And do you take the necessary precautions to protect the information stored on your cellphone? It is vital to remember that all the information on your mobile device is easily accessible. Most cell phones users do not protect their cell phone privacy. • 41% of cell phone owners back up at least the photos, contacts, and other files from their phone. • 32% have cleared their phone’s Web browsing or search history. • 19% (especially younger phone owners) have turned off their phone’s location-tracking feature due to concerns that companies or other people might access that information. These percentages are quite low considering the fact that 88% of U.S. adults own cell phones. I Want to Be #1 on Google! I want to be #1 on Google! I want to be #1 on Google! While researching the terms SEO or Search Engine Optimization. I came across many funny videos that used this phrase to explain what SEO really is. SEO is a term and a function that many may not have come across or are not knowledgeable about. “SEO is a bit like fishing.” View the video below. It compares SEO to fishing and it tells the viewer to hire a SEO company if they are not succeeding in SEO on their own. However, it is important to understand how SEO is used and why before reaching out to a company that specializes in SEO. I believe SEO is successful when a website is designed for users and search engines. The best sites are created with a keen understanding of visitors’ interests, needs, and expectations. Text, visual design, organization, and navigation should all work together to allow visitors to find key information and reach a goal — the one you hope they reach as a marketer — quickly and easily. To get to this point with your site, you need a clear site structure that is easy to navigate, follows a hierarchy of content, and feels natural and intuitive to visitors. I believe the rise of social media is fairly new and it continues to grow tremendously and has a major effect on the lives of consumers. So, it is only natural that company’s are active on the same mediums that are gaining the attention of consumers. Due to the rise of social media, some companies may not know how to be socially active with consumers on social media and there are still a lot of companies that do not want to take part in social media, as well. In order for companies to be successful in social media, they need to be creative and find out what works for them and their target audience. 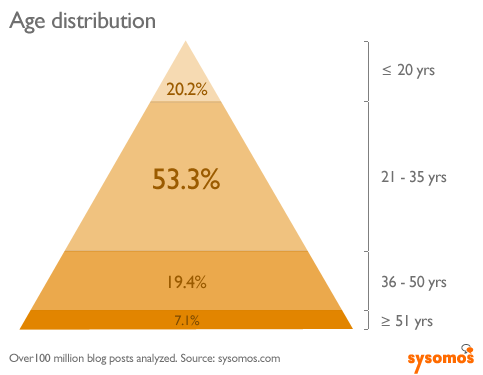 According to Sysmos, most blog posts are written by the younger generation between the ages of 21 to 35 years old. Unofficial company blogs are very powerful amongst consumers. It gives a sense of honesty, transparency, and open dialogue for the company that is being blogged about. It some ways people may feel as though this may hurt or help a company. It gives a chance for consumers to voice their concerns, gives tips/advice, stay active with other consumers, and to even praise the company. Either way, this will allow the company to improve or expand on different aspects of their business. Do I love blogging? The simple answer is yes. Why do I love blogging? In one word; connecting. Connecting with others that relate to the words I have written in a post and vice versa. I too connect with the words written by another blogger. Sometimes an avid discussion may occur in the comments, different points of view offer insights into a topic I may have just been discussing solely from what I know. In hearing a variety of opinions; it helps my work, my studies and opens my mind to what readers are thinking and feeling on particular subjects. It gives me a bigger picture. It shows me what it may be like in someone else’s shoes. Creating a successful blog is not an easy task but it stems from the consumers. Check out a post on MarketingProfs title “Passionate About Your Product: What Brands Can Learn From Unofficial Bloggers” It is a great conversation that the authors has with a popular Starbucks unofficial blogger, Melody Overton. Digital storytelling is a unique type of media because it allows a brand to be transparent and communicate a story about a brand from a humanized and personalized level. Consumers respect honesty and transparency from companies. A great example of digital story telling is the greek yogurt brand, Chobani. On Valentines day of 2011, Chobani launched a national campaign called Chobani’s Real Love Campaign. View the video below. The video takes you behind the scenes of the Chobani Real Love Campaign shoot. It features real consumers who share their love for Chobani. Not only is this great digital storytelling but the viewer is able to see behind-the-scenes footage of the consumers making the Real Love Campaign video. Under Armour is an American company that specializes in sports clothing, athletic shoes and accessories for men and women. For some time now, the company has used short films to market to their consumers. Their short films are highly captivating and speaks volumes about the company and their determination. Check out the Under Armour video below, which highlights the female athelete. The video is quite captivating because of the powerful bass in the video, the music. Additionally, the video shows the strength of a female athelete. And not to mention the choice of words and questions asked at the end of the video: Are you going to let them beat you? Or you going to protect this house? Watching this video makes the viewer believe the commercial is directed towards them. The power of short films not only builds movements (as we can see in the world today), but it connects people to each other. It’s an emotional tool that people can become part of, not just in the online space. Once your message is out there, and it’s engaging, people can become aligned with your values for years, and it creates new possibilities and new collaborations. This video is used as an emotional and motivational tool. It is a connection to dedication and preserverance. Social media has won the hearts of many people that are looking to reconnect and share their lives with others. Now social media is a way for business to interact with consumers. And if businesses have not recognized the importance of social media then they are truly missing out. Best Buy made great gains as the purveyor of modern technology, but is now closing many of those same retail locations. For some, it is a basic misunderstanding of changing consumer needs, but for others it is a fundamental refusal to engage consumers on their terms in the social media universe. Utilizing social media is aiding consumers on their own terms but it is, also, beneficial to businesses because of instant interaction. Companies are able to promote their businesses, events, activites. It is also an avenue to respond to positive/negative responses in a timely manner. Additionally, it can be used as a research tool to find out what consumers are saying about your companies products and what interests your target market. Social media is useful in many aspects. A great example of a company using social media to their advantage is Qdoba Mexican Grill. A blogger, Erica Finley, wrote about her experience with the restaurant through social media. She went to Qdoba and ordered the chicken 3-Cheese Nachos and instead of putting the queso into the bowl, as they always have, the staff put the queso in a separate smaller container. The chips, chicken, and shredded cheese were all put in a separate bowl. There are two ways to order nachos at Qdoba: chips on the side and ingredients all in a separate bowl or everything all in one bowl. So Finley was not happy because the new procedure only required Qdoba to only supply half of the queso than they typically did and it required for her to dip a chip covered in chicken and shredded cheese into a tiny cup of melted cheese. After a few bites, the meal was messy. So, Finley went on her twitter account sent a twitpic of her meal and asked why the queso was in a separate tiny container. 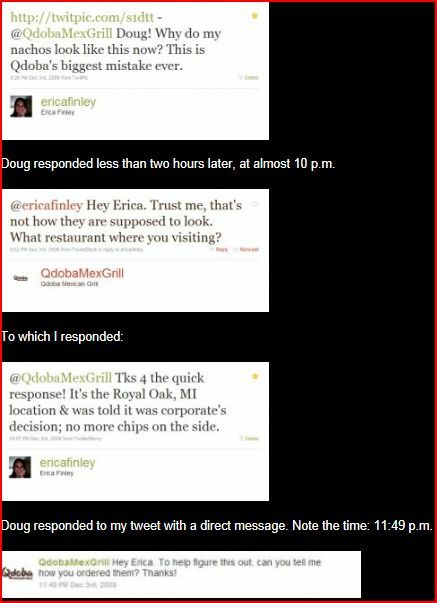 Two hours later a staff member named Doug responded directly to her tweet and he said that he would forward the issue to the Qdoba operations team. Five days later she was informed “a communication was sent to all of the restaurants, instructing stores to continue honoring ‘chips on the side’ at the request of its guests. She went back to her nearest Qdoba restaurant and everything was back to the way she liked it. The world and, especially, the United States is a huge melting pot. The growth of minorities signifies the need for brands to market to minorities. Therefore, the minority purchasing power is growing. The video below illustrates the rise of minorities that will continue to grow for years throughout the United States. Take a look around and almost everyone is on a mobile phone, a tablet, or anything that is not a traditional PC. Nowadays, we can read the news, book a flight, and research information all while still laying in the bed. Sabina Adler wrote a blog entitled 5 Key Concepts For Mobile Web Design to Look Out For in 2013. In the blog, Adler wrote that as of July 2012, there were 6 billion mobile subscribers worldwide (which is 87% of the worlds population) and as of December 2012 the mobile share web traffic was 14.55% compabred to 8.04% in 2011. With this information in mind just think about the use of mobile web traffic in 2014. Sabina Adler says that mobile internet usage will take over desktop usage by 2014. The percentage of mobile usage in 2011 nearly doubled in 2012. See the chart below. It is important for companies to be conscious of mobile friendly websites because of the growing use of non-traditional PC’s to view websites. On a mobile phone, websites should have less clutter, easy to navigate, big buttons to select items, contact information present and readily available and overall aesthetically appealing. So, what does your favorite company’s website look like on a mobile device? Some consumers may even judge a company by the ease of use of their website on a mobile device. Many company’s have even created a mobile version of their website. What is emerging media? My definition of emerging media is innovative and interactive technology utilized to share ideas and communicate with others. I use the word innovative to describe emerging media because media is always changing and it is improved technology of a previous medium or combined mediums. For example, The printing press have been transformed through the application of technologies such an image manipulation software like Adobe Photoshop and desktop publishing tools . Secondly, I use the word interactive because interactive means something different to everyone. People utilize and engage in technologies, in ways, which enhances or is valuable to their lifestyle. Examples of emerging media are digital television, webcasting, podcasting, cell phones, blogs, gaming, social media and networking sites. Emerging media is a dynamic technology. Below is a Youtube video, which was created in 2011, to showcase a montage of all the current emerging media. Emerging media is important because it is crucial that marketers keep up with the times and understand how consumers/the world communicates. It is a way for marketers to connect and share ideas with consumers in their own element. In 2012, Business2Community’s Frederic Gonzalo posted his thoughts on the 13 marketing trends for 2013. Three of the marketing trends stood out to me the most and are crucial components to marketers. Photo-sharing is also a prominent trend and was introduced, in 2012, in the form of social networking…Pinterst and Instagram. 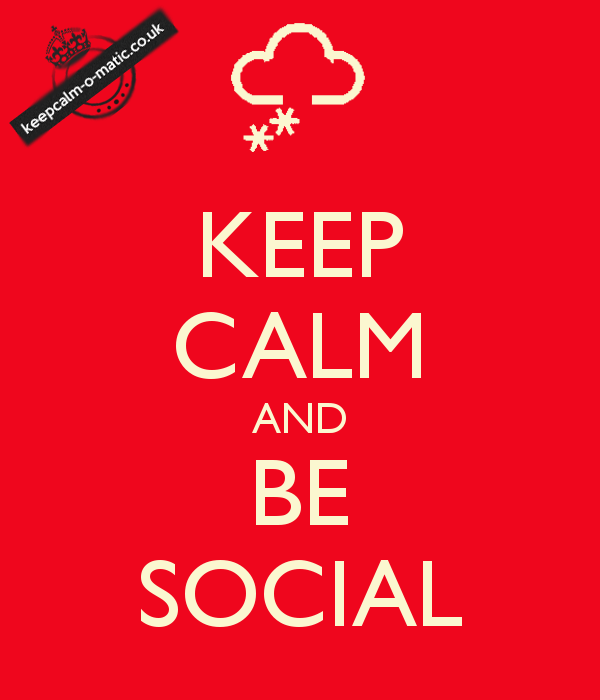 Last but not least, strategic social media is becoming more common. Many brands have active accounts on social networking avenues to interact, communicate, and solve issues consumers may have. However, the questions becomes is strategic social media being used effectively?